Similar to Vitamix, Blendtec recently announced their 2014 Holiday Sale that will be sure to save you at least $150 on some of their top blenders. This Blendtec holiday promo is the only way to get the lowest prices ever on the Certified Refurbished blenders again this year at our LOWEST PRICES EVER! 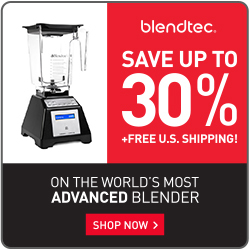 Starting November 1st, 2014 and ending December 1st, 2014, Blendtec will be havinga HUGE sale on all of their Certified Refurbished Blenders. Save an additional $30 off the already reduced prices plus FREE SHIPPING. The Blendtec Holiday sale really is the same deal that we provide you everyday. Free Shipping on all Blendtec blenders and an additional $30 off Blendtec Cerftified Refurbished Blenders. Blendtec Blenders have continued to be one of the top 3 selling blenders on Amazon.com. The top 3 selling blenders on Amazon.com include blenders manufactured by Blendtec, Nutribullet, and Ninja Professional blenders. If you have any questions regarding this Blendtec blender sale or any other personal blending equipment, please contact us!